If you haven\'t heard of Eragon by now, you\'re either living under a rock or you\'re Amish. The marketing bonanza that accompanied the book and motion picture were something that almost couldn\'t be avoided, and many of us tried. Instead of seeing a movie like Batman, Lord of the Rings, or Pirates of the Caribbean and then playing the associated game, I wanted to skip past the hype machine and make some judgments on how the game stood on its own. To the few who aren\'t in the know, a home-schooled teenage boy from Montana crafted the story in his spare time. The Paolini family self-published and promoted the book at local schools and libraries until it was finally picked up by Knopf Books, and was eventually made into a movie, followed by a video game on no less than seven different systems. The story revolves around the life of a fifteen year old boy who happens upon a glowing blue rock, which turns out to be a dragon egg. He raises the dragon, Saphira, and sets out to avenge his uncle\'s death and slay the fanatical king Galbatorix. All of the traditional fantasy fare are present here: elves, dragons, magic, and epic battles. With their previous success in the Lord of the Rings games, Vivendi and Stormfront Studios seemed like a good choice. Fantasy stories like this one naturally lend themselves to video game adaptations since the entire world has already been defined, so all that\'s left to do is to overlay the game mechanics on top of the existing setting. The game starts out with a short, boring tutorial level. You\'ll notice a number of things right off the bat. The character models are ugly. It\'s easy to differentiate between the characters, but the graphics are something you\'d expect about five years ago. Animations are not only limited, but awkward, as well. The background visuals, however, are much more appealing. This is probably due to the fact that the developers actually traveled to the movie sets and took digital stills, using them to recreate the scenes you\'ll find in the game. But as you progress, you\'ll learn to hate the environment, for the camera angles (in an attempt to be more cinematic, I guess) are fixed and you\'ll have to fight it as much as your enemies. In some areas, this fixed view makes that ledge you\'re supposed to jump up to nearly invisible. The platforming elements are pretty basic as it is, but this obstacle makes them even less enjoyable. One of the first magic spells Eragon learns is telekinesis. Pushing, pulling or lifting objects is probably the most common solution to the puzzle-solving in the game. The areas where this magic can be used are always marked with a blue symbol, removing most of the guesswork, so when you get to a gap that cannot be jumped over, that loose block or stack of wooden boards will be highlighted for you. The only other objects that can be manipulated besides those predetermined ones, are monsters. It would have been fun and challenging to make this system a little more open ended, like the one on Psi-Ops where you can move virtually any object, but I imagine it could not be done in time to release alongside the movie. If you can manage to target them, the enemies can be pushed or pulled off the side of cliffs or into fires, into other monsters, etc, but after the 50th time doing so it gets kind of boring. Later, you\'ll learn how to set enemies on fire, which helps tremendously with combat, but that novelty wears off pretty fast, too. Unfortunately you\'ll be forced to use this magic over and over, because as a young boy and a novice dragon rider you simply can\'t compete with the Urgal hulks. Mashing buttons to attack would be a decent strategy, considering all the combos are pretty much the same, except that they will be blocked or countered every time. Instead of giving us the impression that the boy is outmatched or inexperienced, it only serves to frustrate the player. The falling backwards animation as you fail will be seen no less than 200 times during your stay in Alagaesia. Combat, in general, consists of a seemingly endless string of enemies, followed by a cutscene, then more of the same enemies, and so on. If they wanted to avoid giving away any parts of the plot or spoilers, they\'ve done a hell of a job, because I had no idea what was going on or what was expected of me or what my objectives were most of the time. The jumps between each location are jarring at worst, abrupt at best. The book and movie, as I understand them, make it a point that Eragon and the dragon Saphira are partners. Eragon does not think of her as a pet or a sidekick, but as equals that can learn from each other. 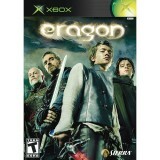 The game puts the focus squarely on Eragon, though. There are only three short levels out of around twenty that the dragon rider actually rides a dragon, and one of those is limited to flying on rails in a circle and eating doves. Not exactly what I\'d call action. They sprinkle a few events into the traditional levels where Saphira can clear out larger groups of enemies or set fields on fire to smoke out the Urgals for you, but like the highlighted magic symbols, these actions are all scripted. The multiplayer doesn\'t add a whole lot to the game, or spice it up in any way. There\'s a hidden level that can be accessed after finding the secret dragon egg in each level, where you fight a sort of endurance match in front of Galbatorix, but other than that the extras are all of the \"making of\" variety. Interviews with the actors, behind the scenes at development and sound recording, etc. are all here if you\'re interested. Fans of the movie will appreciate the movie actors appearing to do the voice work for the game. While none of them are particularly well-done, it\'s certainly better than having strange new actors to blurt out the lines. Perhaps curiously, John Malkovich (who plays Galbatorix, the final boss) has no speaking lines in the game. Previous fans of the material will get the most enjoyment out of Eragon, while the rest might be lost or just wonder what all the excitement is about. The gameplay is just too repetitive, the puzzle solving and platforming faulty, and storytelling sorely lacking. The game can be completed on normal difficulty in under five hours, so it might be a better investment to just buy the book or see the movie. You\'ll get the same duration of entertainment at a fraction of the price, and without a watered down version of the story.